*NOTE: This integration is only available for accounts created prior to January 2016*. For accounts created after January 2016, you can use our Chrome Clipper to create profiles from Twitter. Twitter is an online social networking and microblogging service that enables users to connect and express their views via short messages - tweets. By installing this integration, you can filter Twitter by multiple search terms that relate to your business and this way capture new leads which then can be saved in OnePageCRM. 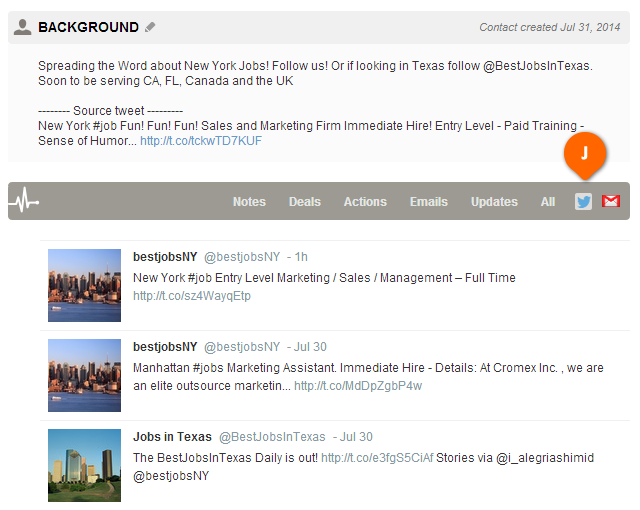 The newly created contacts are automatically assigned a Next Action, lead source, contact owner, status and tags. 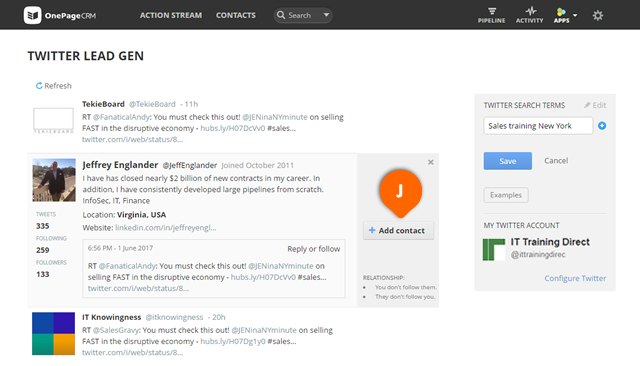 Recent tweets of the new contact are also pulled and displayed under the Twitter feed in the contact's timeline in OnePageCRM. 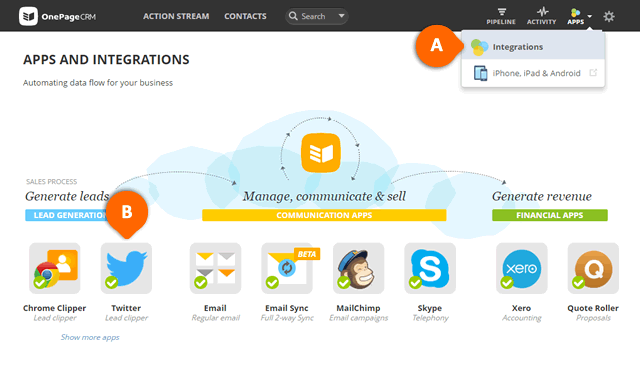 Go to Apps > Apps and Integrations (see A). Click on the Twitter logo under the Lead Generation Apps category (see B). On the Twitter page, click on the Install button to enable this integration (see C). Once this integration is installed, you are brought to the Configuration tab. In Step 1, create a free Twitter account if you don't already have one. 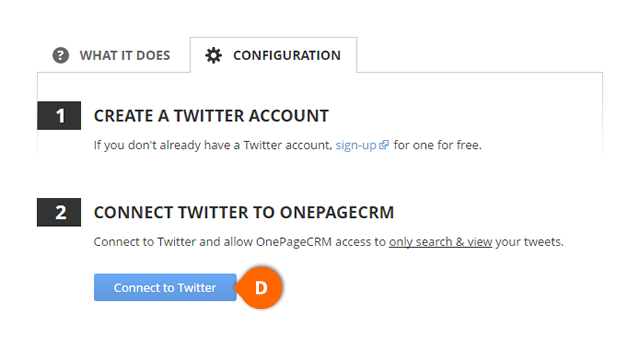 In Step 2, connect your existing Twitter account to OnePageCRM by clicking Connect to Twitter (see D). 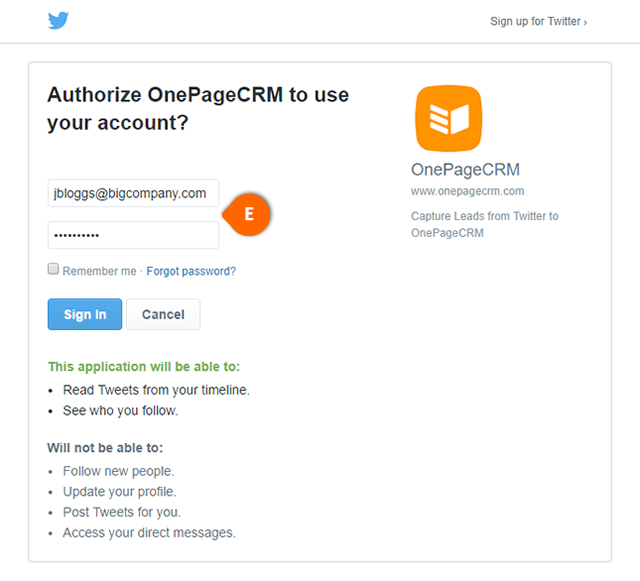 Sign In to Twitter to authorize OnePageCRM to only view and search your tweets (see E). Once you've successfully connected your Twitter account with OnePageCRM, go Apps > Twitter Lead Gen page to start generating leads (see F). Select Pin this application to the Apps menu (see G). Enter a search term (see H) and click Save to filter Twitter. To enter multiple search terms click on the + icon (see I). To save a lead, open a tweet of your choice and click Add Contact button (see J). 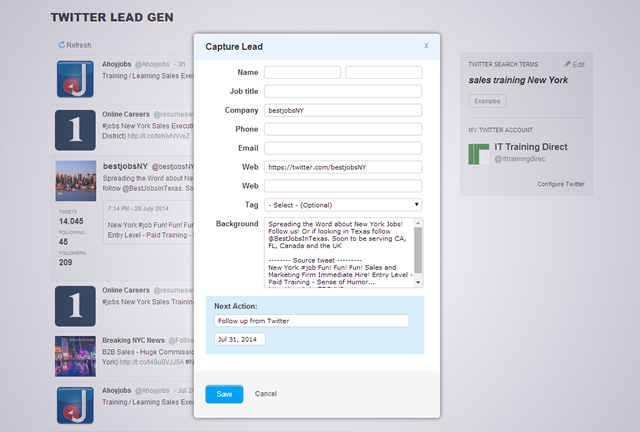 In the Capture Lead pop-up, public Twitter details of a lead are displayed. Edit details if required or add more information such as contact's Name, Job title, Phone, Email, Web and an existing OnePageCRM tag. A Next Action for this lead is pre-populated and scheduled for the following day. Click Save to add contact to OnePageCRM. Once contact is saved, the original tweet is marked with a green tick in the top right corner and shows a Successfully added contact! message together with View Contact link to the contact's OnePageCRM profile. To check contact's Twitter feed, scroll down to the timeline and click on the Twitter icon to view up to 30 most recent tweets (see J). 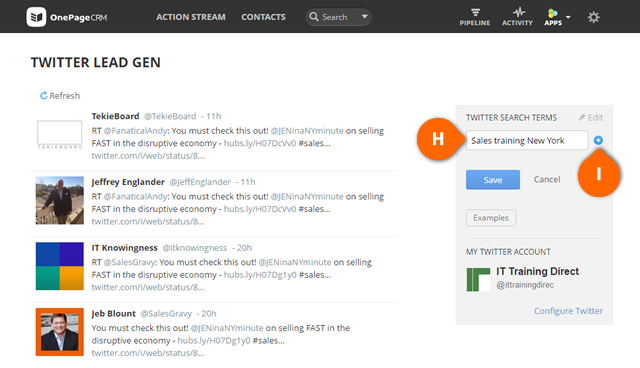 Twitter Lead Gen integration can be installed and configured by Account Owner or Administrator. When saving a lead from Twitter, the Twitter name details are placed a Company field. For cases where Twitter name contains two or three words it will be automatically split to First name and Last name fields. Twitter search results are shown in the timeline from the most recent up to a week old.